In decision making, we might be considering several factors before we can make our final thought about a certain thing. We seek advice, ask for guidance from our close friends and inquire for opinions from our loved ones. There is one thing that should surpass all these considerations and that is to listen to Him as He wants us to make right decisions and directions that are according to His will. 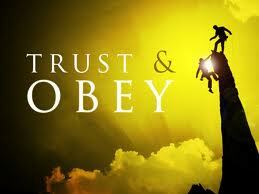 He will provide us the instructions and steps that we must take but we must obey it without a doubt and questions. I remember those days before coming here in Dubai, I was asking Him to give me answers whether to leave or stay in Singapore. God told me to wait as He was "cooking" something special for me. I waited patiently for His answers and after five months, I left for Dubai. Before leaving Singapore, I had many questions. Am I ready to leave my ministry and lifegroup? What does future hold me in Dubai? Is there any lifegroup and I can join with? With all those questions, He insisted that I should go here, so I obeyed even if it hurts leaving people behind who made me for who I am right now. They are my second family and I treasure the friendship I have with them. So I packed my bags and went here. There were some challenges and moments of sadness but He helped me a lot and made me realize that there is more in this place than my job. I'm starting to love my stay here and I believe that there will be more precious moments that I can treasure from this country. Maybe God wants me here for a reason and I am still waiting for that revelation. With these things that I have experienced, I learned that for us to be able to hear Him clearly about His instructions, we should have a clear and pure heart. We must ensure that our intentions are good and obey Him without a doubt. Surrender everything to Him and be persistent in praying as it is indeed the most powerful tool we have. I remembered that I even fasted for two weeks just to get the answer and the results were according to His plan and I believe that time will come that what my heart desires can be found here. I also had peace in here that I didn't feel during my last days in Singapore since I had many things on my mind and some problems that I didn't know how to solve. His instructions are clear, wait for His time as He has the perfect timing in everything. Knowing and trusting God's promises will erase the doubts that we have. Maybe the answers that we are waiting for might take months before we receive it. I realized all of this in Psalm 25:9, "He guides the humble in what is right and teaches them His way". There is no useless time in waiting for his instructions as we can be sure that the directions we need is the right and perfect way.